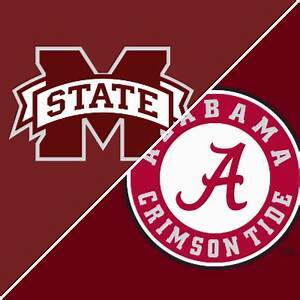 #16 Mississippi State Bulldogs @ #1 Alabama Crimson Tide NCAA Football Week-11, SEC-West Division Betting preview for Saturday, November 10, 2018. Written by College Football Expert ATS Analyst Al Presto. Charliessports.com produces it for Football Betting. NCAA Football Weekly Predictions are the best in the industry and will continue through the BCS-title game in 2019. We’re always providing BETTOR Friendly cards. Our signature 500* pick premium ATS Predictions are unreal & I promise you won’t regret purchasing, cash in Daily. The (6-3) SU/ATS Mississippi State Bulldogs beat Louisiana Tech last week 45-3 SU as twenty-three point home FAVORITES AGAINST THE POINT SPREAD in a tune-up for this week’s huge obstacle. Mississippi State hasn’t played very well on the road this season in conference play beginning with a 28-7 loss to Kentucky as nine and a half point road FAVORITES ATS. They were expected to lose in Death Valley against LSU which happened 16-3 in a span which they dropped three of four ATS. The Bulldogs know what’s in store Saturday, they’ll be fired up and can only hope Alabama has a lingering effect from last week rivalry game in Baton Rouge, Louisiana. The UNDER is 6-0 Mississippi State last six games vs. Teams with a winning SU record. Mississippi State is 1-4 ATS the last five times the teams have played in Tuscaloosa. UNDER bettors have cashed in the Bulldogs last four on the road against a team with a winning home record. The Bulldogs have stayed UNDER the total their last five games. 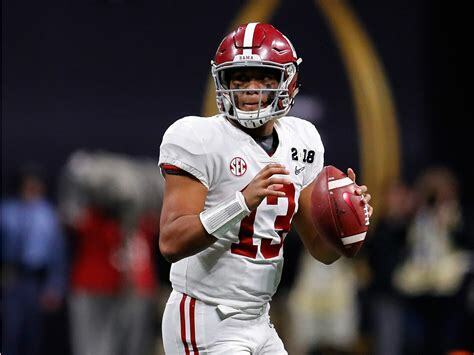 The (9-3) SU, 6-3 ATS Alabama Crimson Tide took another step in their quest to the BCS Playoffs last week with a 29-0 win over LSU as 14-point road FAVORITES ATS. Last Saturday’s highly anticipated contest was supposed to expose a weakness in the Crimson Tide, but as usual, they proved to be too much for the opponent. 2018 heisman trophy front-runner Tua Tagovailoa threw his first interception of the season in the shutout only to prove insignificant as he went 25 of 42 for 295 yards through the air with two touchdowns. Alabama is 4-1 ATS their last five against teams with a winning SU record. The home team is 6-2 ATS the last eight meetings between the teams. UNDER bettors have cashed in 8 of the last eleven times, the two teams have played. The OVER is 3-1 Alabama last four at home. 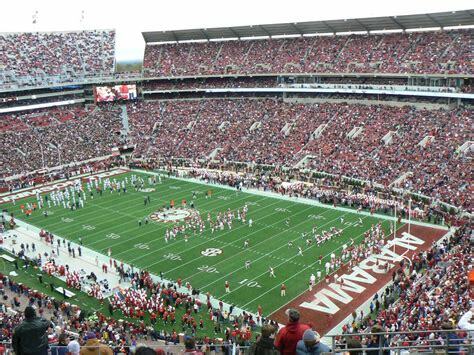 Saturday’s game is at 3:30 PM EST at noisy Bryant-Denny Stadium on campus in Tuscaloosa, Alabama. The CBS Television Network will be broadcasting. The Opening Betting Line has Mississippi State as twenty-three point road UNDERDOGS ATS. The TOTAL is 53 points for Saturday’s contest. Since taking over for current Florida Gator head coach Dan Mullen, Joe Moorhead is doing an admirable job his first year on the sideline in Starkville, Mississippi. However, Mullen brought his Florida team into Davis Wade Stadium on September 29th for a 13-6 win over the Bulldogs. 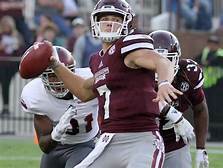 The Mississippi State offense is led by dual-threat quarterback Nick Fitzgerald who can do a better job trying to beat Alabama with his legs than arm. Mississippi State has rushed for (2,077) total yards on the ground which ranks 19th in the FBS. The average (6.5) yards per play which is 20th in the nation. Running Backs Aeris Williams and Kylin hill must take some of the pressure off of Fitzgerald by catching passes out of the backfield. The Bulldogs defense hasn’t faced an offense like they’ll see Saturday and it’s the job of coordinator Bob Shoop to have them in position to make plays. Mississippi State gives up an average of (14.6) ppg, and the (288.0) total yards per contest allowed ranks fifth in the FBS. A key to a Bulldog upset Saturday is to somehow create a few big plays on offense, they must also sustain drives to preserve their defense. Mississippi State has been eliminated for Conference title contention. What else can be said about Nick Saban and his Alabama Crimson Tide football team? In twelve season’s on the sidelines he’s become a legend, and in the 2018 BCS title game showed why. With his looking for a spark he came out of the locker room with an unknown quarterback by the name of Tua Tagovailoa who led the Crimson Tide to the win. The move is trying to be replicated by Clemson, Notre Dame along with many other power five football institutes. Although everything is in place for an Alabama vs. Georgia matchup for the 2018 title game, Saban wants to go undefeated. Alabama has scored 462 total points this season which is the best in College Football. Running Backs Najee Harris (572) yards on the ground along with Damien Harris lead the 26th ranked rushing attack in the nation. South Florida native Jerry Jeudy has (880) receiving yards which are third in the SEC. The Crimson Tide defense accepted the challenge of LSU last week by pitching their first shutout of the season, and they sacked the Tigers quarterback five times. They’re allowing (15.9) ppg while giving up (309.2) total yards per contest. Alabama gives up (4.6) yards per play which is 10th in the FBS. Alabama has to come out and play their style of football to remain unbeaten; with the annual Iron Bowl showdown with Auburn along with a title game vs. Georgia is looming they can’t afford to become complacent. Bovada.Lv, list the Alabama Crimson Tide at -225 to win the 2018 SEC Championship. Free Pick. Alabama-23 Points. Also Play Online Poker Plus Other Casino Games and enter some of the best Tournaments on the World Wide Web. 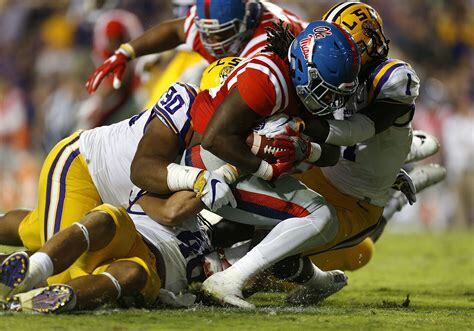 Ole Miss rolls into LSU for Week 5 College Football SEC West Betting matchup. Written by The Best College Football Expert Analyst Al Presto. Charliessports.com produces it for Football Betting. NCAA Football Point Spread Picks are the best in the industry and will continue through the BCS-title game in 2019. Winning Sports Handicapping Experts at Charliessports.com knows a thing or two about wagering on NCAA Football because we have seen a few things in the Football landscape. The 3-1 SU, 2-2 ATS Ole Miss Rebels bounced back last week to beat Kent State after a disastrous 59-7 home thrashing by top-ranked Alabama. The home team is 4-1 ATS their previous five times Ole Miss has played LSU, but the Rebels are 3-0-1 ATS their last four on the road. The 4-0 SU, also 2-2 ATS LSU Tigers began the 2018 season barely making the top twenty-five and now they’re ranked fifth in the nation. With wins over Miami on a neutral site and two weeks ago a 22-21 victory at Auburn the Tigers are ready to compete for a BCS playoff berth. LSU has gone OVER the total twice this season, but the UNDER is 3-1-1 the previous five vs. Ole Miss. 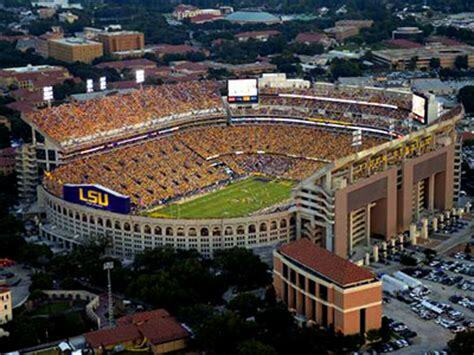 Saturday’s game is at 9:00 PM EST at Tiger Stadium on the banks of the Mississippi River in Baton Rouge, Louisiana. The ESPN Television Network will be broadcasting. The Opening Betting Line has LSU as an eleven and a half-point home favorite against the point spread. The betting odds total is fifty-nine and a half points for Saturday’s contest. Ole Miss began the 2018 season with an impressive 47-27 win over a good Texas Tech team in Houston a game which head coach Matt Luke watched his offense produce 546 total yards. The Rebels scored 76-points the next week in a victory over Southern Illinois, and it seemed as though the unit unstoppable. However after scoring a touchdown against Alabama on the games first play it proved to be fools gold as the Ole Miss offense was held scoreless the rest of the contest. The Rebels have lost 12 of the previous 16 SU to LSU, and they’re 1-3 ATS the last four. Ole Miss is also 3-0 ATS the last three away from Oxford, Mississippi dating back to 2017. They’re also 7-2 ATS their last six at Tiger Stadium. Luke knows he must score points to pull off an upset, and he has the weapons to move the football, but they’re challenged on the other side of the football. Bovada.Lv, list the Ole Miss Rebels at +1,600 to win the 2018 SEC-West Championship. 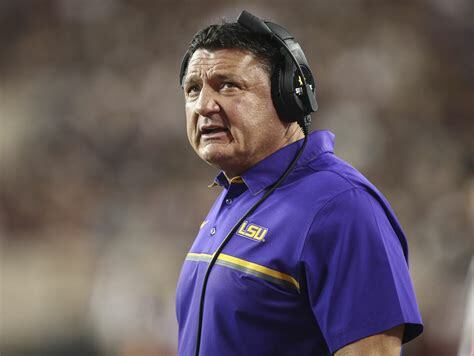 LSU head coach Ed Orgeron is off to a great start to the season considering a lot of Tigers supporters didn’t endorse his getting the job. The Tigers took care of Louisiana Tech 38-21 last Saturday, and they’re aware it’ll be tough sledding each week as SEC play is in full swing. 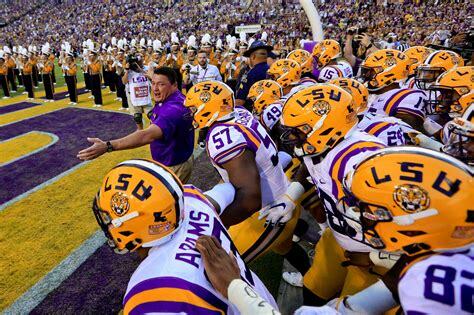 LSU is 7-0 ATS their last seven vs. SEC opponents. The UNDER has cashed in five of six times they’ve allowed fewer than 100 yards rushing in their previous game. Ohio State transfer quarterback Joe Burrow has the faithful believing he can take ink out a win any Saturday. A trip to Florida awaits LSU on October, 6th and it looks like the Gators are rounding into form after an early home loss to Kentucky. Also with Georgia and Alabama set to invade Tiger Stadium within the next five weeks it’s essential the coaching staff have them in the moment. LSU should be able to run the football Saturday with Nick Brossette and Clyde Edwards-Helaire against an Ole Miss defense that allows 170.7 rushing yards per game. Bovada.Lv, list the LSU Tigers at +1,150 to win the 2018 SEC West Division Title. Free Pick. LSU-7. Also Play Online Poker Plus Other Casino Games and enter some of the best Tournaments on the World Wide Web. 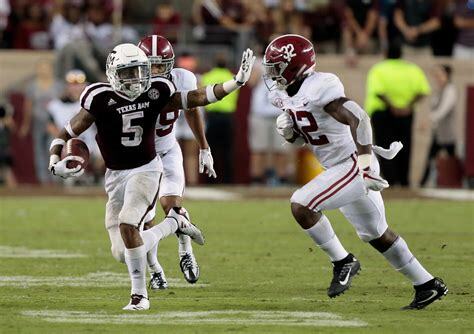 Texas A&M Aggies at Alabama Crimson Tide 2018 Football Betting Preview. Written by The Best NCAAF ATS Analyst Charlie Red McDougall. Charliessports.com produces it for Football Betting. College Football Weekly Predictions are the best in the industry and will continue through the BCS-title game in 2019. Winning Point Spread Experts at Charliessports.com will again fulfill our promise of delivering winners daily in NCAAF, NFL, and Major League Baseball. In 2012 Heisman trophy winner Johnny Manziel took Texas A&M into the Heart of Dixie and pulled off a 29-24 upset as a 13-point road underdog. It’s been All Crimson Tide since winning five in a row SU, going 3-2 ATS with four of the previous six staying UNDER. Current Texas A&M football coach Jimbo Fisher knew what he was getting into when he accepted the job in a football-crazed LONE STAR STATE, and it’ll also be the Aggies first road trip in 2018. The (3-0) Alabama Crimson Tide just like Saturday’s opponent are 3-0 ATS, going OVER twice but last week’s 62-7 win at Ole Miss stayed UNDER. The home team is 4-1 to the POINT SPREAD the previous five between the teams. Their’s little doubt the early public money will be on Alabama as the line has already moved two-points in favor of the home team. Saturday’s game is 3:30 PM EST at Bryant-Denny Stadium in Tuscaloosa, Alabama. The CBS Television Network will be broadcasting. The Opening Betting Line has Alabama as a twenty-five and a half point home favorite against the point spread. The betting odds total is sixty-one points for Saturday’s contest. Expect the improbable when wagering on College Football which is why Texas A&M believes they can pull the monumental upset Saturday and not just Against The Spread, they think they’ll win SU. Only two weeks ago the Aggies lost to number-two Clemson 28-26 on a failed 2-point conversion. Fisher inherited plenty of talent at the skill positions and there rushing attack ranks 8th in the nation. Running Back Trayveon Williams 399 yards through three games is the most underrated at his position in College Football. The OVER has cashed in the last four games when the Aggies have produced 450 or more total yards in their previous contest. However, the offensive line will have their work cut out vs. a Crimson tide defense that’s surrendered just twenty-eight points this season. Quarterback Kellen Monds averages 9.3 yards per pass attempt with a 62.9% completion rate. The Texas A&M defense ranks twelfth in the FBS against the runs, and a massive Alabama offensive line will test them. Fisher comes from the Nick Saban coaching tree and both are native West Virginians. The (2-1) Texas A&M Aggies won’t be intimidated although they understand it’s going to be a hostile environment, the kids from Texas will welcome the challenge. Bovada.Lv, list the Texas A&M Aggies at 20/1 to win the 2018 SEC Title. Last Saturday Night in front of an ESPN audience the nation saw Ole Miss get out to a 7-0 lead on a 75-yard touchdown pass only to see the Crimson Tide put 28 unanswered points on the scoreboard. The Rebels got shut out the remainder of the contest. The Tua Tagovailoa vs. Jalen Hurts battle for the quarterback job is history as the sophomore has thrown eleven touchdowns with two interceptions through three weeks. Alabama is an ATS cover machine in September with their last five getting the money for the betting public, and Las Vegas will continue to inflate the lines. The OVER is 5-1 the last six they’ve played in the same month. The 170 points scored this season ranks 1st in College Football, and the 7.7 yards per play is seventh in the FBS. The defense allows opponents 4.5 yards per attempt with opposing offenses doing better throwing the football rather than running. 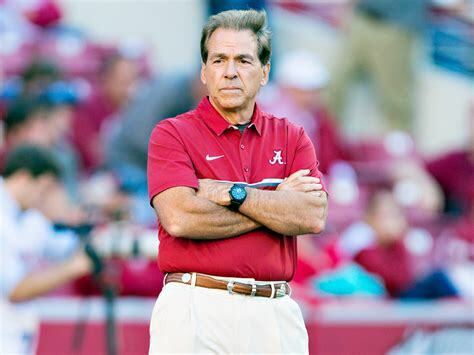 However, Saban is trying to emphasize to the unit of cut down on penalties which could haunt them against a team with the offensive talent of Texas A&M. Things could get interesting with intangibles Saturday Night in Tuscaloosa; there are many Houston area players on both rosters. Bovada.Lv, list the Alabama Crimson Tide at 7/4 to repeat as BCS Champions. Free Pick. Texas A&M+25 And A Half Points. Also Play Online Poker Plus Other Casino Games and enter some of the best Tournaments on the World Wide Web.